On disc 1: City of Detroit Michigan, speramus meliora resurget cineribus. Lyrics for disc 1 and production notes inserted in container. excellent rapper submitted by j mckinley on August 10, 2015, 10:23pm Rap god and the mosnter were my favorite tracks. Eminem is a lyrical genius. Check out his other albums as well if you like thismone. 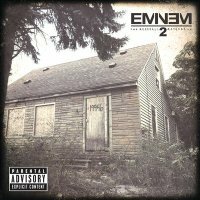 great album submitted by kelleyc on June 22, 2016, 12:59pm Eminem is definitely one of those most talented rappers, and this is a great display of his talent. Great submitted by wgregory on July 3, 2016, 8:21pm Lyrics are good. Eminem gets better as he gets older. Santa Monica, CA : Aftermath Records, p2013.